Why are there padlocks on these gates and bridges? We saw them everywhere. On bridges over the Danube, on gates, on the grates that covered monuments, and even on the decorative trim on fountains in the market square. Padlocks of all sizes and colors, locked onto the iron structures. Of course there’s a story here, and the tour guides love to tell you all about it. 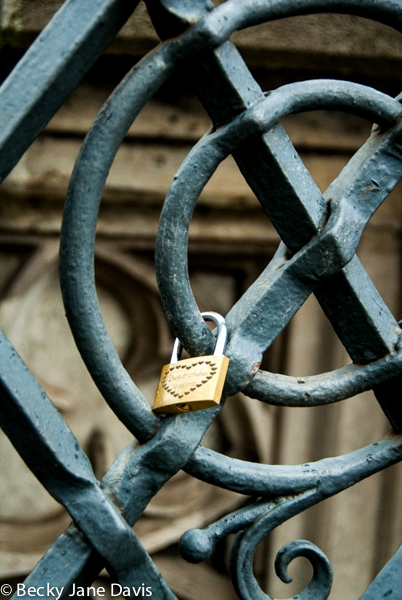 The padlocks symbolize a couple’s unending love for one another. The key is thrown into the Danube, or fountain, so the padlock can never be opened.love lock or love padlock is a padlock which sweethearts lock to a bridge, fence, gate, or similar public fixture to symbolize their love Typically the sweethearts’ names or initials are inscribed on the padlock, and its key is thrown away to symbolise unbreakable love.” – WikipediaThis Love Lock was attached to the Beautiful Fountain in Nuremberg, Germany in the Haupmarket Square.